Home / Safer Driving / Car safety / What are ‘Smart Motorways’ and what changes are planned for 2018? Towards the end of 2017, plans were announced to introduce new laws and legislation to govern drivers using smart motorways. 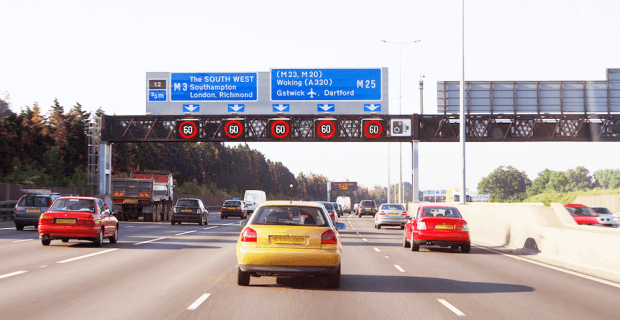 Though the number of smart motorways have increased gradually for a number of years, there may still be people, in particular new drivers, who are unaware of what the name refers to – and may be unaware of the laws that govern them. Smart motorways are stretches of motorway that use technology in order to help direct and control the flow of traffic. Through the use of variable speed limits and hard shoulders, this has led to more reliable journey times, fewer road accidents, reduced vehicle emissions and improved traffic flow. The first smart motorway was introduced on the M42 in 2006, but has since been extended to various other sections of UK motorway – including sections of the M1, M4, M6 and M60. For more information, watch this short video on smart motorways from Highways England. There are 3 classifications for smart motorways currently. This includes controlled motorway, dynamic hard shoulder and all lane running. Controlled motorways have three or more active lanes with variable speed limits. Though there is also a hard shoulder present, this should only be used in cases of emergency. All lane running uses variable speed limits across all motorways lanes, including using the hard shoulder as a permanent running lane. Dynamic hard shoulder incorporates variable speed limits in combination with a hard shoulder running. Signage indicates whether the carriageway can be used as a lane or for emergencies only. It is expected that later this year laws will come into place which will mean fines and points for drivers who ignore the red ‘X’s displayed above smart motorways, indicating a lane closure. This change makes it all the more important to ensure you are well informed about the directions when driving on smart motorways, and stay informed on any changes to driving regulations. To find a full list of smart motorways, see here.